This morning, Verizon announced that it would launch VoLTE and HD Voice nationwide within the coming weeks. They also pinged us later in the day with clarification on how HD Voice calls would be treated compared to regular voice calls (in short: the same). As the evening has progressed, we have continued to learn additional details about Big Red’s full VoLTE launch, including the two devices that will be able to take advantage out of the gate, specifics on Advanced Calling 1.0, how both Video and HD Voice calls are billed, and what happens when a customer hands-off from WiFi to LTE. Before we get into the specifics, below is a carefully crafted chart that compares Verizon’s VoLTE and HD Voice service to the other major players in the game, AT&T, T-Mobile, and Sprint. As you can see, the big sell here for Big Red is video calling as a part of the service, something none of the others are currently offering. With that out of the way, let’s talk details. Verizon is using the name Advanced Calling 1.0 to describe the package of HD Voice and Video Calling. From what I can tell, a customer will need to add Advanced Calling 1.0 to their service in order to place either type of call, assuming they have a compatible device. That may require them to update their phone as well. What I do not know yet, is if Verizon plans to charge a fee for this add-on or if it will be free of charge. I do know that customers will be able to find self-serve options for adding Advanced Calling 1.0 in their account through My Verizon or they can talk to a Verizon rep.
Once Advanced Calling 1.0 has been activated on your device, you will find an option for “VoLTE Call” under Settings>Mobile Networks on your phone. Toggling this on or off turns Advanced Calling 1.0 on or off. Verizon will update this Advanced Calling 1.0 page as we get closer to launch. You will be able to visit that to get started. According to information passed along to us, Verizon will have two devices ready for VoLTE go-live, the Samsung Galaxy S5 and LG G2. There are all sorts of other devices that will be updated over time to work with VoLTE and HD Voice, but those are the first. On a related note, there are accessories like wired or Bluetooth headsets that will work with HD Voice calls, but they need to specifically say that they support it. As we mentioned earlier in the day, HD Voice calls are treated just like traditional calls. If you participate in an HD Voice call, it will count against your minute bucket, unless you have unlimited talk through your plan. No data charges apply when placing an HD Voice call. As for video calls, things are much different. 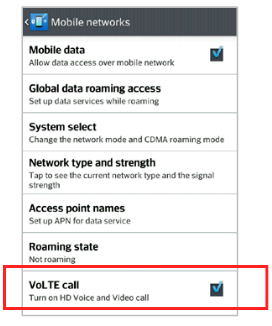 When you place a video call over VoLTE, the audio portion is actually billed as a traditional voice call, but the video portion is billed as data. According to Verizon, a user could consume 6-8MB of data per minute during a video call. In other words, if you were on a video call for around two hours, it could use up to 1GB of data. Video calls placed over WiFi do not count against your data plan. If you would like to place a video call over LTE, Advanced Calling 1.0 will automatically create a group in your contacts with others who have video calling capabilities. So instead of trying to figure out who you can video chat with over LTE, Verizon will attempt to bundle them in a group. If you are on an HD Voice call (or Video Call through Advanced Calling 1.0) and leave a 4G LTE area, you will drop the call. According to Verizon, there is no mid-call hand-off to CDMA. Video Calls can be handed off to WiFi and back to LTE. With a Video Call taking place over WiFi, customers should see a special icon indicating as much. If you have any questions about HD Voice or VoLTE, be sure to drop them in the comments.